It is a tradition eating kabocha on Winter Solstice will help against bad luck and sickness. The kabocha we use were grown by everyone at Jukai Intermediate School. Please enjoy it! 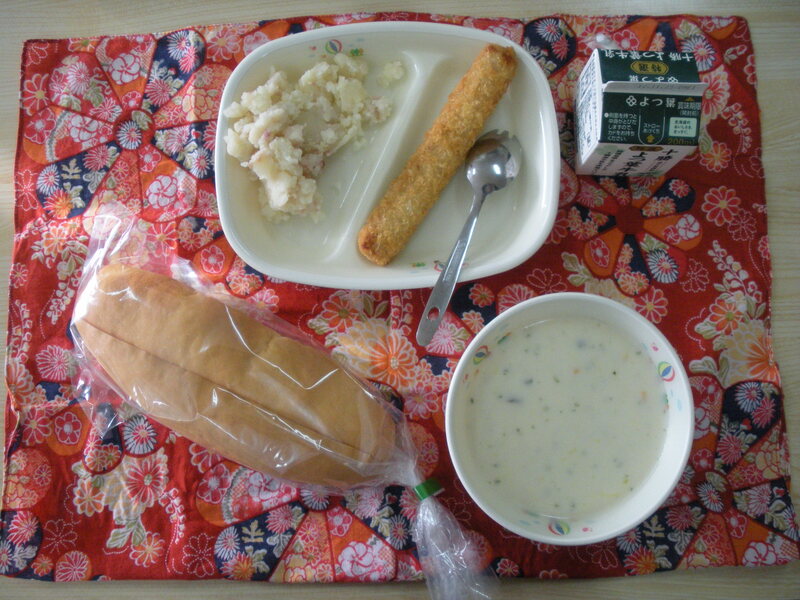 If you have read my “about” page, you will know that my favourite school lunch item is today’s touji shiruko (Midwinter Soup). They don’t serve it every year, so I am so happy I can eat again. Anyway, shiruko is a sweet adzuki soup with mochi in it, and on touji, kabocha is added to the soup as well. It is really quite sweet so while many girls like it, some of the boys finding it too cloying to eat. 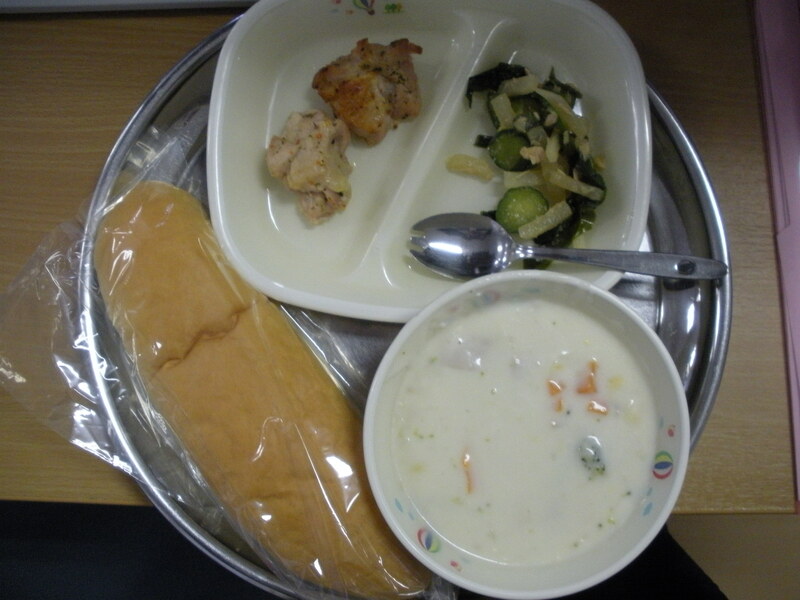 Today it was served with bread, which is a little unusual, but many of the students in my class said bread was better than rice. Eating bread with shiruko made it just like eating anpan. I don’t especially like anpan, so maybe I would have preferred rice. The rest of school lunch was tasty too. The mince patty had a light taste of chives, which was nice and the salad was not a Western-style raw salad, but rather the Japanese-style salad consisting of blanched veggies and dressed in a white sesame sauce. Speaking of salads, I’ve finally realized that raw foods–be they meat, fish, or vegetables–and I are not meant for each other. Not only do I just not like foods raw, but they tend to upset my stomach as well. So yeah, I was happy eating today’s Japanese-style salad. A close up of today’s Toji Shiruko. You can see some adzuki, mochi, and kabocha resting on my spoon. This the first time we’ve had Chestnut Squash Roll. Using chestnut squash that we can enjoy the sweetness of kabocha with, it is then wrapped with surimi and fried.